Introducing Sierra Skinner, a resident of Union City who is a senior in high school and the daughter of Stephen and Alice Skinner. Skinner began drawing as a toddler. Her sister, Olivia, loved to play games with her and draw cartoons. This little sister would just say “go draw;” thus, Sierra sat down and began drawing, and a new artist was born. Born in Indianapolis, her family moved to Union City a few years ago when her mother and father found a “dream” home in Union City, Indiana, one of the many beautiful historic homes in the city. 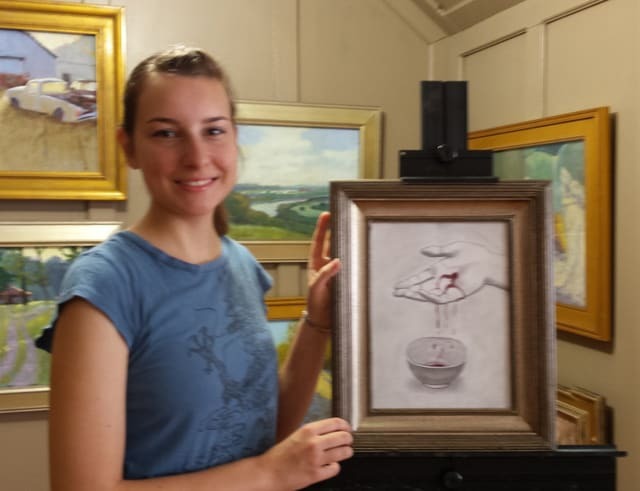 The Oakton Foundation holds bi-annual competitions for adults and high school students to award the best original painting or sketch that communicates a moral truth with excellence to a wide audience. Potential mediums are limited to oils, acrylics, pastels, water color, charcoal, pencils, or similar mediums. Entries are be judged on the basis of creativity, quality, and effectiveness in expressing the contest theme. Art today has become so individualized that 10 people seeing the same piece would come away with ten different opinions about what it is communicating. Art promoted in Christian venues can lack creativity (e.g., slapping a verse on a picture of a lighthouse). We do not seek “Hallmark card” art, i.e. purely landscape scenes that may be lovely to view but do not communicate a deeper message. The tension is being able to communicate deep truths without being so obvious that the art lacks creativity, nor so obscure that most people cannot agree on its meaning. Art is worship; artists are called to “co-create” with God. Artists should produce works that lift up “the good, the true and the beautiful” — not meaning it has to only portray happy scenes, but if it portrays suffering or tragedy, it should portray it truthfully – with God we have hope and redemption, without Him we are lost. Good art tells the truth about the world, the human condition, and God (preferably without including words in the work). Your craft should be done with excellence. Culture would benefit from a wider range of art that advances God’s Kingdom principles and can be understood by both Christians and non-Christians. Skinner and her family attend Cornerstone Baptist Church. The class rejoiced with this humble, talented, poised, young woman. Her father is also a published author. Now Skinner is learning a new medium – oils and through the eyes of her mentor, instructor has done some amazing work in oil. Watch for this new talent to emerge and blossom.